Description: The Nano SP is a Group 1-2 -3 high-backed booster with added side impact protection and comes complete with an integral harness suitable for children from 9kg to 36kg (9mths – 11 years approx). It is really lightweight, robust and very easy to transfer between vehicles. 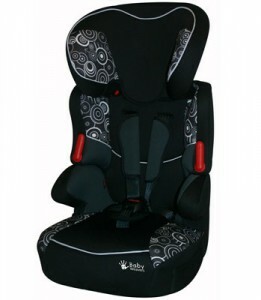 Simply remove the harness when your child is approx 3 yrs of age, this then leaves a substantial booster seat with arm rests and back for an older child, and then when your child is older remove the back to leave just the booster seat. The car seat easily fastens into the car with the vehicles 3 point harness. Simply fits in the car with the vehicles 3 point seat belt. I put my 3 3/4 year old into this car seat at first because he always wants to try the new things. I found that this seat was far more secure than his old one so I have changed him into this one. I tried it out on my 19 month old and he fits in it well. There is nothing worse when you are loaded with shopping bags, in a busy car park, you have a kid on each arm trying to stuff them in the car, while getting soaked and trying to keep them dry, you get in and you spend ages trying to fasten them into car seats. Well this one is so easy, it’s done in 5 seconds. I really cannot recommend Kiddiecare or this car seat enough. It fits a wide age range, looks great and is very safe. I love this so much so, I’ve just bought another one for the younger baby, that’s how much I recommend this product. Thank you Kiddiecare for sending me this great car seat to review.I think this is one of the best car seats I have ever seen. It was easy to install, it looks great, its sturdy and safe. Also it was delivered within 18 hours of being ordered, how fantastic is that. Kiddiecare is the best site for choice, ease of ordering and delivery. can you by the harness seperately ? Do you mean using the seatbelt without the harness?